Abortion is haram in Islam, in whatever stage of pregnancy the woman is in. Right from the time of conception abortion is haram. All scholars agree on this point. Deliberate termination of a human fetus in a surgical, chemical or by any other artificial method is intrinsically an unlawful act in Islam and its doer will be held liable both in here and in the hereafter. A pregnant woman from the Islamic point of view is not the owner of her fetus as parents are not the owners of their children. She is rather entrusted with a human being in its early stages of its life responsible for its nourishment and development. The likeness of a mother's womb in Islam is the likeness of enriched tilth for cultivation. In Islam ‘all life matters'. Killing an innocent human even in its early stages as in abortion is like killing the whole of mankind, and to save a single human even in its fetus or embryonic stage is like saving the life of the whole of mankind. Killing an innocent human is considered to be one of the mortal sins. · When there is a possibility of harm to the mother and the doctors consider the harm to be great (to the mother). · If the foetus is illegitimate and its presence will be a source great difficulty in the society, due to which there will be spoiling of society. 2. After the soul has entered the foetus – Ayatullah Sistani says the soul enters the foetus after the completion of the third lunar month. Without consent of Spouse :If a mother aborted her fetus without the consent of her husband, he should be compensated and as the ‘killer' of her child, she will be deprived of inheriting from her child. Similarly, if a man forces his wife to abort the fetus he is liable to compensate his wife and as the ‘killer' of his child, he will be deprived of its inheritance. With consent of spouse If both the husband and wife were involved in the abortion the fiscal penalty has to be paid to the second level of inheritors of the fetus ie the paternal grandparents and siblings of the foetus. It is wajib to pay the diyyah to the inheritor of the fetus. If the inheritors forgive, then diyyat does not have to be paid. According to Ayatollah Khoei, the foetus remains in each of the stages of nutfa, alaqa and musgha for 40 days. Thus it is important to know in which stage the foetus was aborted and the diyyat paid accordingly. Ayatullah Khoei mentions that in any stage of abortion, there is no kaffarah along with diyyat. Ayatullah Sistani mentions in any stage of abortion (if it was not allowed) there is kaffarah along with diyyat. Kaffarah – 2 months of consecutive fasting and feeding of 60 poor. The usage of various contraceptives which temporarily prevent conception are permissible in Islam, given they do not cause serious harm to the mother. 1. Deliberate termination of a human fetus in a surgical, chemical or by any other artificial method is intrinsically an unlawful act in Islam and its doer will be held liable both in here and in the hereafter. 2. A pregnant woman from the Islamic point of view is not the owner of her fetus as parents are not the owners of their children. She is rather entrusted with a human being in its early stages of its life responsible for its nourishment and development. The likeness of a mother`s womb in Islam is the likeness of enriched tilth for cultivation. 3. In Islam ‘all life matters`. Killing an innocent human even in its early stages as in abortion is like killing the whole of mankind, and to save a single human even in its fetus or embryonic stage is like saving the life of the whole of mankind. 4. Killing an innocent human is considered to be one of the mortal sins. 5. There are specified fiscal penalties for killing or aborting a fetus. Although there is no ethical difference between taking the life of an unborn child at 5 weeks gestation or at 24 weeks gestation, given that the same child is just 19 weeks more mature, there is a different fiscal penalty for them. 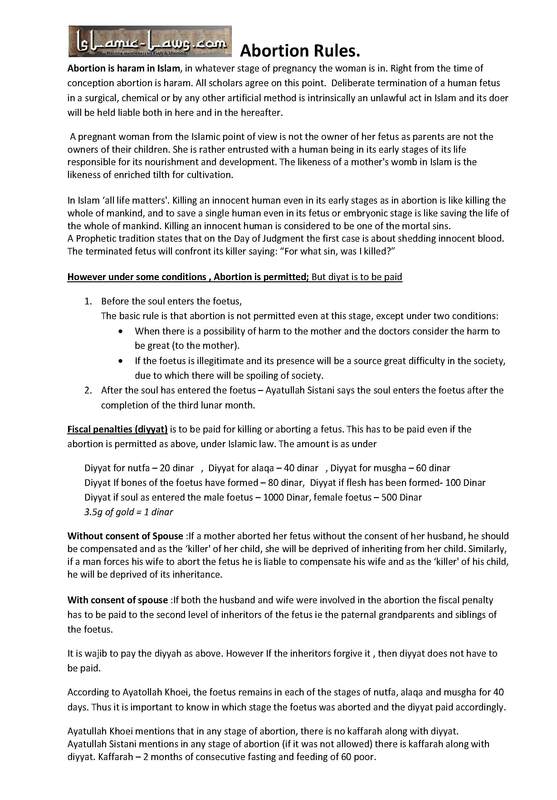 In Islam, the age of the fetus is divided into five stages commencing from the very conception and the amount of the penalty varies accordingly. 6. If a mother aborted her fetus without the consent of her husband, he should be compensated and as the ‘killer` of her child, she will be deprived of inheriting from her child. Similarly, if a man forces his wife to abort the fetus he is liable to compensate his wife and as the ‘killer` of his child, he will be deprived of its inheritance. 8. The above verdicts are for the cases where abortion is done for selfish and personal reasons and not medical. Abortion is permissible only if the life of the mother is at a serious risk, otherwise. The doer, however, will be still liable to pay the fiscal penalty. 9. The usage of various contraceptives which temporarily prevent conception are permissible in Islam, given they do not cause serious harm to the mother.